We were invited to offer a personal problem; it was made quite clear that we had to be comfortable with this. Without saying what the problem was and with the facilitator’s help a ‘human sculpture’ was made to represent the problem. In this instance there were forces pulling him in two directions (partner and ego) with this person’s current/former employer behind and his future employment/employer in front. 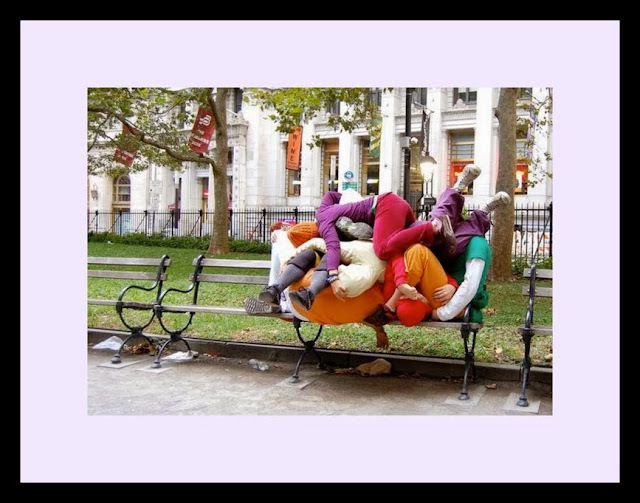 There were therefore FIVE participants who made up the ‘sculpture’. It was fascinating to have each factor comment on how they felt, even if this ‘factor’ was an entity, psyche or ‘unknown’ future. This was recognised as a way to see the problem for what it is, for the problem owner to see it as others see it, to get the sentence that an entity, played out as a person, can have feelings. I particularly liked the idea of being able to talk to the desired or possible outcome in a kind of role play. The technique from the B822 Technique Library where you do something similar is with ‘Timeline’ placing people at points now and in the future. In a way I did this years ago to visualise a careers advice video using members of a Youth Theatre who had to be someone 1, 5 and 10 years along a career path based on different decisions they took at 14/16 regarding school, a job, training or university. P.S. The image above might offer part of our conclusion, that all the factors should be brought into consideration. What is more, where the problem isn’t too sensitive or the individual/participants want an aide memoire then a series of pictures could be taken. When is it appropriate to use Creative Problem Solving? By Jonathan Vernon in B822:Creativity, Innovation and Change, Creativity on January 30, 2012 .